Baja California Sur is a place like no other in the world. A remote, narrow strip of land only 60 miles (100 km) wide, Baja California Sur has 1385 miles (22230 km) of coastline along two bodies of water, the Sea of Cortez and the Pacific Ocean. Translation: there’s tons of fishing in Baja California. You could spend a lifetime fishing here and never get bored. Whether you like inshore, near shore, offshore, fly fishing, rock fishing or lagoon fishing, there is something here for everyone! Baja California Sur has lots of fishing towns, such as world-famous Cabo San Lucas and San Jose del Cabo, as well as Loreto and La Paz. But, what makes this place so special to anglers is the variety of fishing spots. Major bays include Sebastian Vizcaino, Magdalena, La Paz, Asunción, Ballenas, Concepcion and San Carlos. There are also estuaries and lagoons at Puerto Escondido, Nopoló, Blandra as well as the San José estuary at Cabo Colorado, the San Ignacio Lagoon and the Ojo de Liebre. 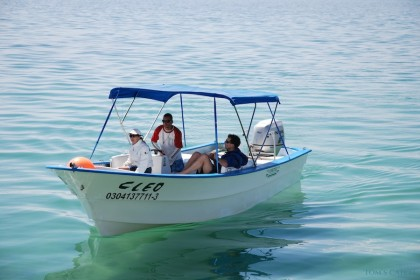 Fishing the Sea of Cortez from Baja California Sur is an island adventure. Near shore the fishing is rock-oriented. Anglers use heavy tackle (50 lb gear) and the fish average about 20-40 lbs. Fishing from locations such as Isla Espiritu Santo, local anglers use sardinas for bait, but live bait is not critical. 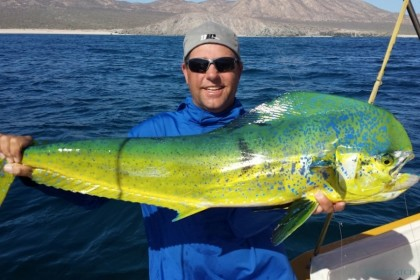 The best time to fish is when the seas are flat, and there are plenty of fun species to catch: pargo, yellowtail (amberjack), dorado (mahi mahi), and wahoo are consistent bites. Striped marlin are plentiful the late summer months of August and September off of Cabo San Lucas and into the Sea of Cortez, between Loreto and La Paz. In October local anglers pitch or drop back baits to swordfish cruising and finning on the surface, their numbers increase with the full moon. In November, striped marlin make their runs into the Sea of Cortez, following the annual baitfish migration. According to Saltwater Sportsman, in December and January, “Striped Marlin remain the protagonists in most offshore battles for boats fishing along the coast of Mexico’s Baja California Sur as the marlin follow the annual baitfish migration.” At the same time of year, schools of dorado exit the Sea of Cortez looking for warmer waters, and anglers drop lines around weed lines and debris to catch them on their way south. The Pacific side of Baja California Sur is home to some of the most remote fishing destinations in the world, such as Bahia Magdalena (aka Mag Bay). 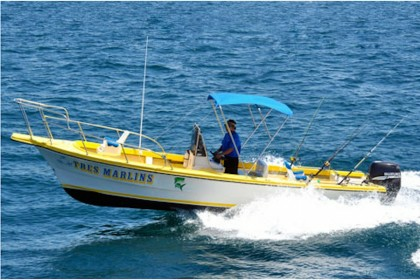 This 30 mile long bay is formed by two sandy barrier islands named Isla Magdalena/Isla Margarita and provides incredible inshore and offshore fishing. Here, the fishing season for marlin is generally from October, when massive schools of baitfish attract hordes of hungry stripes to Bahia Magdalena, through to January. Summertime is peak striped marlin fishing season on the Pacific coast of Baja California Sur. 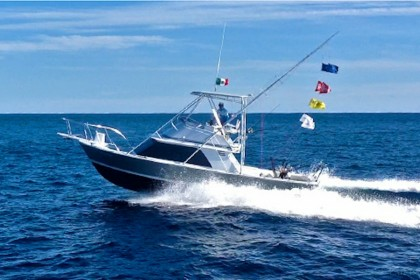 From May to fall, just off the back at Cabo Falso (near Cabo San Lucas) on north to Golden Gate Bank, and west to the San Jaime Bank, dramatic underwater topography and abundant bait offer prime fishing grounds where catching marlin is routine. 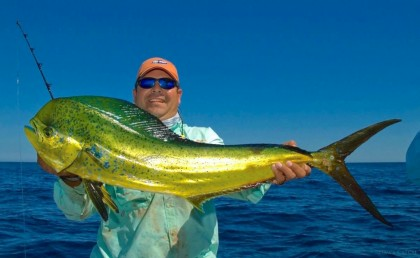 This area of Baja California Sur is the hottest fishing destination in all of Mexico. The confluence of the Pacific and the Sea of Cortez bring Marlins so close to shore, legend has it that one was caught on a hand line from the docks at Cabo San Lucas in the 1950’s — giving birth to the sportfishing mecca that Cabo San Lucas is today. 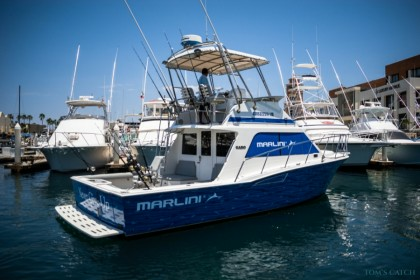 "Cabo is in a class by itself when it comes to striped marlin fishing...there are more striped marlin caught within 40 miles of Cabo year-round than any place else. It's no accident. 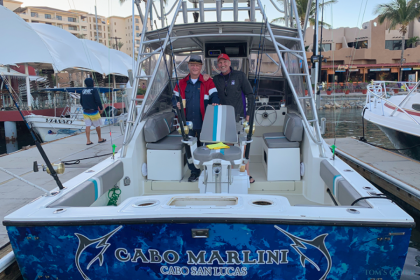 Cabo is the crossroads for most of the marlin that migrate through this part of the Pacific, and it is home base for a large school of resident fish that never leave the area. If you have never wet a line before in your life, and if for some strange reason you absolutely, positively, must catch a striped marlin before next Thursday afternoon, your odds are better in Cabo San Lucas than any place else in the world… When the bite is on in this part of Baja, you could hook a dozen striped marlin a day here...The odds are good that you would also run into tuna and dorado, maybe a blue marlin, and maybe even a wahoo. Cabo San Lucas fairly glitters with glamour fish." 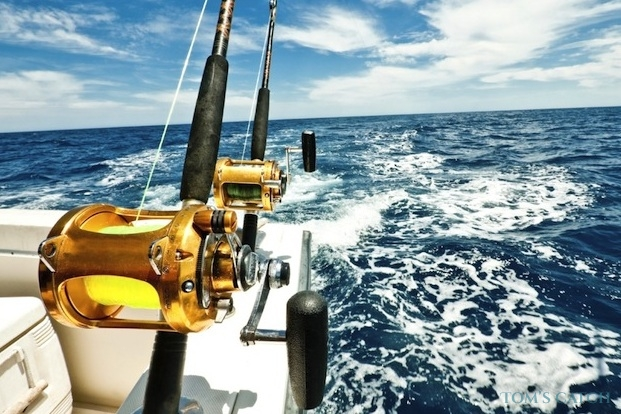 If you come down for a charter, rods, reels and tackle are supplied on the offshore big-game charter boats, but for inshore fishing, it’s always best to bring your own gear so you know what you are working with. Bring offshore lures, leaders and hooks as well, to ensure you have access to tackle in top-of-the-line condition. There are some good bait and tackle shops in Cabo San Lucas. The village of Todos Santos is home to many artists, boutique hotels and bed and breakfasts. You can visit their beautiful beach, Los Cerritos, walk around the lovely town, take a mountain bike tour, and visit the local galleries and soak up Mexican culture. If your goal is to play golf in every corner of the globe, then Baja California Sur will not disappoint, with plenty of premier courses up and down the coast to choose from. Cabo San Lucas is a world class resort, with many opportunities to go swimming, snorkeling, diving, parasailing, play a few holes of golf, and indulge in fine dining. Surf the Earth! Bring your board, or rent one, there are tons of surf spots in Baja California Sur for all skill levels. You can purchase a daily, weekly, monthly, or yearly fishing license. Fishing licenses are available for purchase by mail through the CONAPESCA’s office in San Diego, California. If you plan on using a fishing charter, most charter boats include fishing licenses in the cost of the charter, but to be sure it is best to ask when booking your trip. A Mexican fishing license allows a limit of ten (10) fish to be brought onboard. There is no limit to catch and release. The exception to this rule is Marlin, Sailfish and Swordfish and Shark, of which only one (1) of each is allowed, and which counts as five (5) toward the overall ten (10) fish limit. Additionally Dorado, Roosterfish, Shad, or Tarpon, of which only two (2) of each species are allowed, and which count as five (5) toward the overall 10 fish limit.